Antarctica is particularly sensitive to the effects of pollution as the environment is near pristine to begin with meaning that any pollution is often more obvious, the cold temperatures mean that the natural processes that help remove pollution in other parts of the world happen far more slowly so it has more of a chance to build up. Antarctica is however the most stringently protected part of the earth, there are strict guidelines under the Antarctic Treaty Protocol on Environmental Protection about what can and can't be left in Antarctica, unfortunately though, despite being so far from the rest of the world and not connected by any land mass, pollution from elsewhere does also find its way to Antarctica. As Antarctica is one of the cleanest, least polluted places on earth it is an ideal location for measuring the spread of global pollutants. Minute traces of man-made chemicals used in other parts of the world can be detected in the snow that falls over the region. 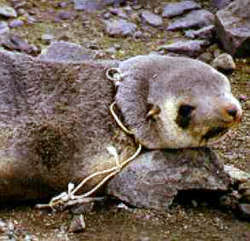 They become concentrated in the bodies of local wildlife such as fish and then seals and penguins. The ozone layer is a layer of oxygen in the form of O3 where oxygen atoms hang around in groups of three rather than the usual two as in the O2 version that we all breathe and need to live. The ozone layer is found in the lower stratosphere about 20 to 30 kilometers (12-19 miles) above the earth's surface. While at ground level it is a pollutant, up there it fulfills the incredibly useful function of stopping too much harmful ultra violet light getting through, soaking up about 97-99% of all the most harmful stuff. 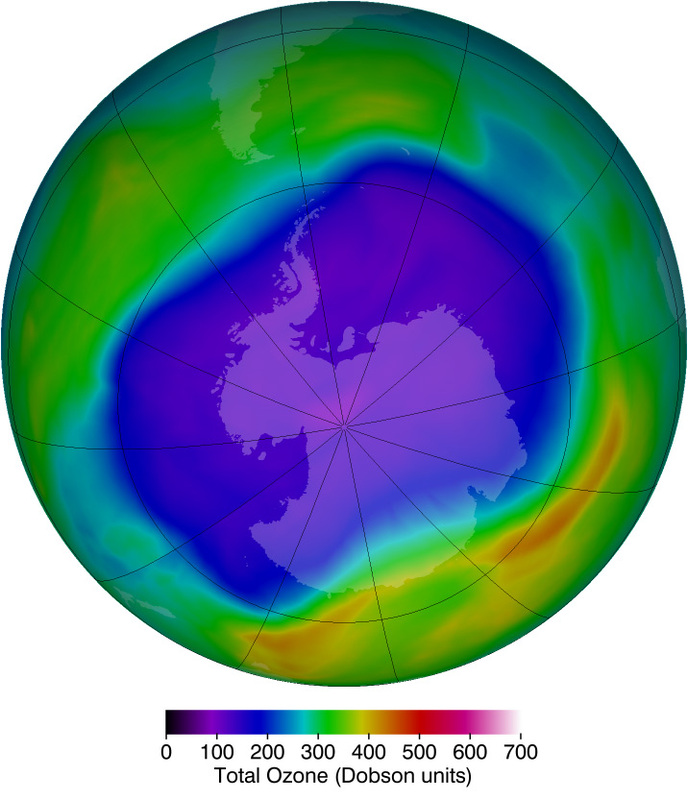 The ozone hole is a thinning of this layer that allows too much harmful ultra violet light to get through the earth's atmosphere over the south pole during the Austral spring. This is caused by the pumping into the atmosphere of chlorofluorocarbons (CFCs) by the industrialized world over a long time period. It has been recognized since the 1980's. The ozone hole is probably the best example of pollutants that are produced in one place, having their effects in another. More mundane, but equally great threats to Antarctica are the effects of casual pollution that goes along with the every day life and activities of personnel on bases and of tourists. In a cold and slowly changing environment the effects of simple events can be there for years. Organic material for instance can take decades to decay where it would be gone in months even in the temperate parts of the world. The outline of footprints on delicate cold climate moss-banks can still be seen years later. Sewage and food waste are allowed to be disposed of at sea in Antarctica by ships and bases on land, though increasingly scientific stations have biological treatment plants that reduce the impact of the raw sewage before it is discharged. This is not the ideal answer though as recent studies have shown that the sewage discharge from the American McMurdo base in the Ross Sea region contains flame retardant chemicals known as HBCD which have been found in penguins, fish, sponges and marine worms that live nearby. The levels of this chemical in wastewater is close to those from highly populated regions of Europe and the USA. This chemical has been shown to disrupt thyroid hormones affect brain development and metabolism in fish and rats. The McMurdo base is probably not unique in this regard, the extent to which it affects other stations around Antarctica is unknown, there are a variety of different types of sewage treatment plants in use. All other waste is shipped out of Antarctica to be dealt with when the ship is unloaded away from the Antarctic continent and ocean. 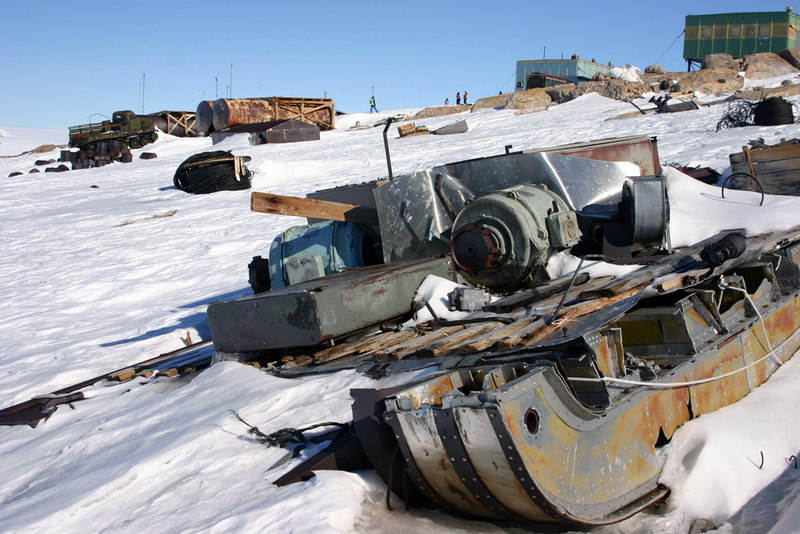 There are still large amounts of rubbish including metal items, oil and other fuels and plastics in a variety of places in Antarctica which are where there were previously scientific stations occupied in either the short or long-term. Once the station was no longer needed the more valuable items would be removed, but everything else was generally just left behind, buildings and all. Because of the extreme weather, something like an empty oil drum can blow for miles away from the site of the base. The picture shows abandoned machinery, sleds, vehicles, oil drums and buildings at what used to be the Russian Leningradskaya base which closed in 1991. Today, such remnants would have to be removed once the base was no longer in use. Oil spills are an increasing form of pollution in Antarctica as a result of increasing shipping activity in the region. While ships often have facilities to contain waste oil and separate oil from water which is then taken out of Antarctica for disposal, an ever greater presence is bound to lead to more accidents which do happen. In recent years there have been a number of groundings of tourist ships in shallow, poorly chartered waters and also accidents involving fishing boats in pursuit of the Patagonian toothfish. 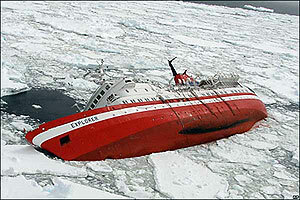 November 2007, holing and subsequent sinking by an iceberg of the M/V Explorer in the Bransfield Strait (picture). The ship was carrying approximately 178m3 of diesel, 24m3 of lube oil and 1,200 L of gasoline some of which was seen to start leaking out over the following days creating an oil slick. Fortunately for the environment the ship sank in deep water away from land and the typically rough nature of the Southern Ocean meant that the oil was dispersed by wind and wave before it could cause any significant damage. With the Southern Ocean being so rich in animal life and any clean-up operation being far from land, oil spills are potentially disastrous in Antarctica. An increasing problem in Antarctic waters (and in the rest of the world too) is marine litter, flotsam and debris that finds its way into the sea or material that is lost overboard from ships, particularly fishing ships. Bits of fishing net, fishing line, boxes, strapping bands etc. might sound harmless if unsightly, but they can have a deadly effect on wildlife. Birds and seals get tangled up up lines and net. 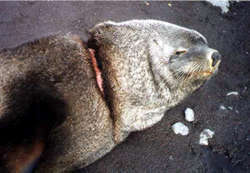 Fur seals can suffer the most as the youngsters in particular are very playful and what starts off as a game with a plastic band can soon turn nasty as it gets stuck over the seals head. Unable to remove the band it begins to cut into the flesh causing physical injury, infection and ultimately a long and slow death.